The Kvedarseminar is the annual gathering for traditional singing, not located at any fixed place. The seminars are open to everyone who is interested in learning traditional singing. At the Kvedarseminar traditional singers meet with their local song traditions. Some of them are professional performers, others are students or amateurs, some are bearers of an unbroken living tradition, others wish to revitalize or restore traditions. The methodology of the seminars developed in two stages. In the 1970’s, a group of young traditional singers arranged an annual “kvedarseminar”. They wanted to come together and bring their mentors, often elderly people with rich material but hardly known or ignored even in their local communities, together with the younger who wanted to learn. These seminars, essential for developing awareness of tradition locally, awakened interest nationally. Historically seen, todays stream of young kvedarar to competitions along with public grants and acceptance of kveding as art, are the result of this process. Kveding, from Old Norse “kveda”, is traditional performance within stanzaic song, characterized as “speech-song”, “speech-near song”, with connected, legato tones, ornaments, free intonation, and a personal style in using the voice. The “music” of the spoken language augments the sentiment in text and tune. bånsull – sulle,lullaby, to lull children to sleep, bånsongar,nursery rhymes and narrative songs for children. lokk – lokke – lokking, hearding song for calling cattle; laling – huvingfor contact between shepherds over great distance. stev – stevja – stevjing,one-stanza form with meaning complete in itself; gamlestev, the oldest type, nystev, a younger form. Stevjing is competitive or dialoguing according to situation and sentiment. 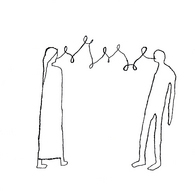 slåttestev, text connected with a particular fiddle dance-tune, introducing “hulling”/”tulling”,a performance for dancing, having nonsense syllable rhyme and rhythm corresponding to the dance rhythm of the dances: springar, gangar/halling. vise, narrative song, includes several types: folkeviser, medieval ballads; kjømeisterviser, ceremonial/ritual songs connected with weddings; skjemtviser, comic ballads; bygdeviser, rural songs;; skillingsviser, broadsides. hymns and religious song preserved in the Haugian tradition represent an old traditional acappella form, including funeral songs. to reach and include the highest possible number of communities and persons, different districts and places over the whole country. The methodology of the seminars is developed during practice. A Kvedarseminar is a structured, multifaceted program open to all. Each portion of the seminar has a clear goal and intention to lift up traditional singing, awareness of traditional forms as song expression. They focus on the individual – his/her expression and tacit knowledge. Engaging local kvedarar and/or kvedarar from other districts with living traditions to perform and teach the forms and their expressions is to transmit the tradition. To learn and use, to care and talk about form and expression is safeguarding, revitalizing and restoring the tradition. Learning about form, expression, and diversity of tradition. The seminar theme is introduced by kvedarar with special expertise in the actual subject, by researcher or representative for a public collection. Learning from and singing with a kvedar. Participants in groups, according to knowledge or expertise in expressing the tradition, learn from or are corrected by a kvedar. The groups rotate. Kveding for the master kvedar. Experienced kvedarar in groups perform for each other under evaluation and guidance by a master kvedar. Seeing and hearing the art of a good kvedar. All kvedarar engaged as teachers hold a concert for the participants or a larger concert or local kvedarar appear in their own concert, possibly with local fiddlers. Being together and kveda – Kvedarkveld. All gather together with the kvedarar. Someone begins, encourages/guides the next, and so on around the ring; or (open form) anyone can take a turn anytime. Festive evening. A local festive evening with local kvedarar presenting their tradition along with fiddlers and dancers; seminar participants are guests, take part in a meal, in singing, dancing and being together. The Annual Meeting of Norsk Kvedarforum determines theme and place for the Kvedarseminar; an elected steering committee, members of the Board included, has the formal responsibility for organizing the Kvedarseminar – including a local kvedar group for planning and implementing the seminar, engaging traditional singers, finding cooperation partners, providing a budget and submitting a financial report. In closing the seminar, participants determine if and how the theme should be followed up, if by a gathering or new seminar. 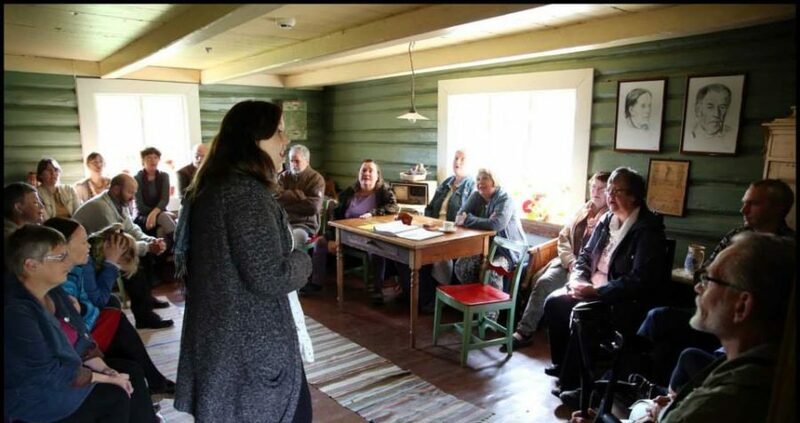 One of the groups learning “bygdavisur”, rural songs, Møsstrond 2013. Photo Øyunn Romtveit. At the Kvedarseminar singers meet, perform and share, demonstrate and teach those who want to learn. The tradition and bearers themselves are in the center, and the tradition’s informal teaching method, step by step repetitive listening – singing, is emphasized. Mastering kveding as a traditional form of expression is a prerequisite for recreating and reviving archival material and music transcriptions. Today kveding is part of music studies; music transcriptions and texts in the oldest collections are treasure troves to scoop from. The tradition forms and expressions is strongly stressed in group forum for young music-schooled performers learning to bring written music and recordings from archives to life for example at the Lindemanseminar Oslo 2012. The publication of Steffen Eides collection “Kjømeistersongar” (2012). A series of concerts “I Lindemans fotefar” (In the footsteps of Lindeman) (2005) involving Kvedarforum members from districts where Ludvig Mathias Lindeman (1812-1887) had been collecting folk melodies. A yearly program for all 6 years old children in a local district in Norway “Barn i lokal songarv – Diktardagar 2015–2017“. All according to theme and place for the Kvedarseminar, there is possibility for seeking cooperation with local and regional organizations, research environment, archives and other public institutions. If the subject for the seminar is folk hymn singing tradition, the local congregation, organist, and minister are to be contacted so that folk hymns can be practiced for the Sunday Service and a church concert held. At several Kvedarseminar the theme has been ballads and expertise from the ballade research Balladeprosjektet has been engaged. Seminars on medieval ballads have engaged persons for example from the Faroe Islands to perform and lead Faroe chain dance, likewise the seminar on Petter Dass songs (2016) bearers from the Faroe Islands, Iceland and Denmark. According to subject, focus on diversity of traditions in Norway means engaging traditional singers among indigenous Sami, – Northern and Southern Sami, national minorities for example the Kven (descendants from Finnish immigrants long ago), Jews and Romani (“the Travellers”). Concert. Kai Åberg and Seppa fon Palm (Finland), Eli Storbekken, Halvor Haakanes og Laila Yrvum (Norway), Ralf N. Rosengren (Sweden) og Henning Gustavsen (Norway). Halden 2009. Photo Knut Utler. Norsk Kvedarforum is a organization for traditional singers. The members represent local traditions all over the country. An annual meeting elects the Board, decides theme and place for the Kvedarseminar and elects the steering commitee. The Board arranges gatherings or seminar on special items.